The Boston Bruins return home for Game 5 on Saturday afternoon with a 3-1 series lead over the Detroit Red Wings. Anything familiar with that situation? 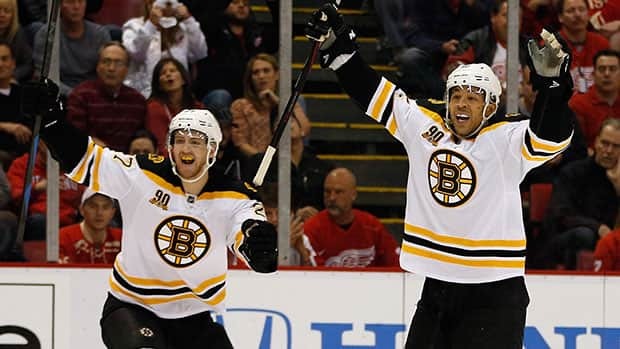 The situation the Boston Bruins find themselves in with their first-round series against the Detroit Red Wings is a familiar one. Last year in the first round against the Toronto Maple Leafs, the Bruins split the first two games at home, then checked in with back-to-back victories in Toronto to return to TD Garden for Game 5 with a 3-1 series lead. In Game 4, the Bruins required overtime to get the win. Boston proceeded to drop a pair of 2-1 games to the Maple Leafs to force a seventh and deciding game. The Bruins escaped with an overtime victory against Toronto in Game 7, even though they fell behind 4-1 with less than 15 minutes remaining in the third period. Fast forward to 11 months later, and the Bruins return home with a 3-1 series lead over Detroit after an overtime win at Joe Louis Arena on Thursday. "We were in this position last year, same thing, winning Game 4 in overtime in Toronto and we all know what happened after that," Bruins veteran left wing Milan Lucic said. "So we're not taking anything for granted here. We all know how hard it is to close out a series, and we all know how desperate they're going to be heading into Saturday. "Again, you don't want to do anything to give the other team life in a series." They don't want to give the Red Wings life and they want some valuable time off because they know that if they do advance to the second round the Bruins' next opponent will be a well-rested Montreal Canadiens team. The Canadiens finished off their four-game sweep of the Tampa Bay Lightning on Tuesday. They were told to stay away from the rink on Wednesday and Thursday and went back to work on Friday. Although time off can be a mixed blessing in the playoffs -- Boston won 10 of its next 12 playoff games after its narrow first-round Game 7 escape versus Toronto -- teams would generally rather have the rest than not. Look at a player like Bruins captain Zdeno Chara. He averaged a team-leading 29:31 in the playoffs last year and that amount of ice time took its toll. Chara wasn't himself in the three defeats in a row to the Chicago Blackhawks to lose the Stanley Cup final 4-2. "We've learned a lot of hard lessons in the past, like Toronto, and fortunately we were able to get out of that one and move on," Lucic said. "Last year, we had Chicago down 2-1 [in the final] and we probably didn't play our best Game 4 and lost that in overtime and weren't able to recover after that." The Bruins recovered after a terrible start in their game against the Red Wings on Thursday. They had been outshot 16-7 by the time Pavel Datsyuk scored early in the second period for a 2-0 Detroit advantage. Then, Boston's top line of Lucic, David Krejci and Jarome Iginla finally got on track. Boston goalie Tuukka Rask, who was named a finalist for the Vezina Trophy on Friday along with Ben Bishop of the Tampa Bay Lightning and the Colorado Avalanche's Semyon Varlamov, was brilliant to give his team a chance to storm back and win the game. Comebacks have been a trend in the 2014 Stanley Cup playoffs. Eight times in 31 games has a team overcome a two-goal deficit, like the Bruins did on Thursday evening. It used to be score first and you'd win. But this spring, we have seen 23 times a team overcome a deficit to win. The possibility of a comeback was another lesson the Bruins learned on Thursday. But then again, they were ahead of the curve on that one. Just ask the Maple Leafs and their fans about that topic.